I just wrapped up running my first Reversing Alopecia online masterclass series. It’s something I’d been planning for a couple of years and finally pulled it off. You can find testimonials below. I wasn’t necessarily expecting any of my participants to start growing hair in the short-term, given that it can take a while for follicles to be signaled (at the onset of the course, I told them about three months in the best of circumstances), but as you can see, several of them saw immediate results. I was scared to death to do this. Would people trust me? Would they believe that I’d struggled greatly, given that although I’d been 1/3 bald, I didn’t do a great job of chronicling my journey with photos—both when things were bad and when my hair was growing back in? Would they believe that I’d worked with many alopecia clients, given that I didn’t have many photos of their journeys, only testimonials? I was obsessive about infusing everything I’ve learned into this course. I launched it, and enrollment started immediately flowing in from all over the world. The alopecia community has been greatly underserved. In fact, what we’ve been served is a big fat bill of goods. As if I didn’t already know it, getting to know more about the experiences of my wonderful course participants has shown me even more how generally ignorant the medical/dermatology/endocrinology community is about hair loss and alopecia. “Thyroid” is my first love. I would not know what I know or have been able to turn my alopecia around were it not for what I’ve learned the last 10 years focusing primarily on the Hashimoto’s/autoimmunity/hormone health community and writing and publishing my Essential Thyroid Cookbook. But alopecia is now my life’s work. I’ve had alopecia universalis since 2008. Having first tried cortisone injections, Rogaine, and laser treatments, these invasive and painful procedures did not resonate with my belief system of holistic healing. I knew there had to be a better way to address my hair loss and find the root cause of why my body was attacking itself. Upon discovering Jill’s work through one of her blog posts, her approach made complete sense to me. I was excited to participate in her Reversing Alopecia online course. I began seeing a small patch of spontaneous regrowth in 2013, but now after completing this course and implementing the steps, my hair is growing faster, stronger, and healthier than it’s been in 10 years and covers about 80% of my head! The information presented through this course was practical, realistic, thoroughly researched, and structured in a very doable manner, as well as incredibly insightful. Knowing what I know now, I can look back and see the triggers that created the environment for autoimmunity to develop. The Reversing Alopecia program gave me a step-by-step approach to address these various factors. I sincerely appreciated learning how to nourish myself better. Thank you Jill for sharing your expertise and for your guidance! Jill, I am overwhelmingly overjoyed at how much information and time and help and passion you have given with this course. Seriously, I want to scream your name from the rooftops. I have a bunch of lashes, a few eyebrows, and random hair in other places, including patches of hair on fingers, toes, arms, and legs (quite a bit on legs) and some hair in the female nether region! I am growing more and more hair daily. It’s unreal. OMG! Thank you so much! I’ve told so many people about you and told alopecians about your next Reversing Alopecia course next spring. I can’t wait to keep updating you. P.S. We love your cookbook! More March 2019 update: I have light hairs growing on my head and I continue to have the same hair growing on my arms and legs and face and arm pits, etc. I do have full lashes and half my brows back and many more light hairs growing there as well. I would like to say thank you so much for a wonderful and interesting course. Already, my scalp and skin overall looks much less inflamed than before and I also have several small patches of new baby white growing. My overall wellbeing has also improved greatly. I know you had to overcome a few obstacles but well done for getting to the end. I’m also so grateful for the wealth of information I’ve learned from you. I will use your knowledge greatly through the resources you’ve given me to help me heal my alopecia. It’s been really an eye opener and something my local GP has no knowledge about. I hope maybe one day they know how to treat it the correct way. You have given me the faith and determination to continue this healing journey and put this disease finally into remission. Many thanks again. Jill Grunewald’s Reversing Alopecia Masterclass has just changed the alopecia community forever!! Her extensive research and knowledge of the many contributing facets involved in autoimmunity is nothing short of incredible! There is finally hope for those of us suffering with alopecia. I found your Reversing Alopecia series so informative and the Facebook group so supportive. I really appreciate all you put into this. It was amazing. My son has white hairs growing in spots so I am anxious to see what happens. You provided so many answers to my “whys” and filled in so many gaps that were close but not yet glued together. You have provided “glue” to many holes from my last three years of research and all the different people that he has seen for his alopecia. As I told my friends, it was technology at its greatest between the video modules, question/answers, and Facebook group of people from around the world all offering information and support. 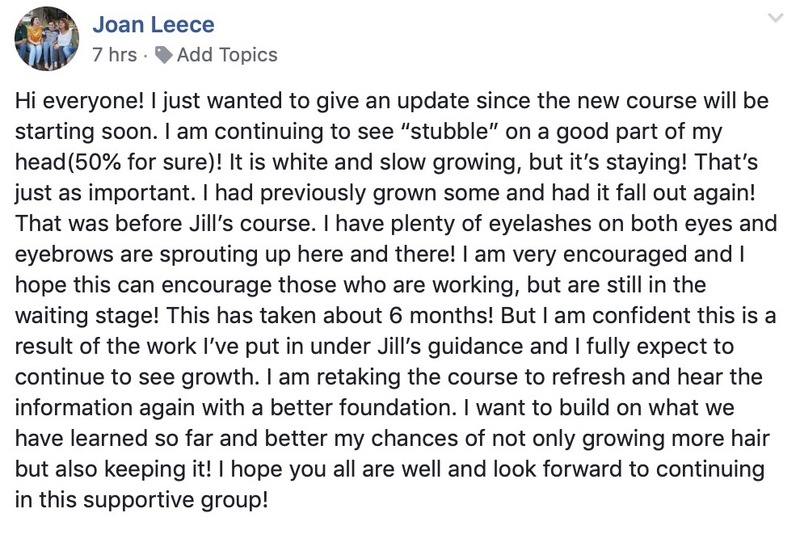 I have been absolutely thrilled with the Reversing Alopecia course and feel quite overwhelmed to finally “meet” someone who is an expert on alopecia. I have been so emotional about having felt so alone on this journey to help my three daughters (one with diffuse alopecia, one with frontal thinning, and a third with no hair loss but other autoimmune tendencies). Jill, thank you for your passion, dedication, and expertise in this area. Your life’s work is having and going to have tremendous impact on so many people. Ok, crying again! Firstly, I cannot thank Jill enough for her professionalism and capacity to engage! My alopecia story is similar to many others, until I run into Jill. I started getting bald spots in 2013. And all the dermatologists I contacted (I have changed doctors a least 4 times!) had a similar, very partial approach: pills of cortisone, lotions, injections, etc. etc. The more cortisone I took the faster the hair would grow back and after a few weeks, even much faster the spots would return again, bigger and more numerous! I felt badly; the cortisone was also impacting my general well-being. It took me 6 years to realize that this was not the right approach for me. I did not feel well at all, and I was still struggling not just with hair loss but more in general with the feeling that I was not listening to my body. While looking online for a more comprehensive approach, I find Jill’s Reversing Alopecia course. Yes, the course DOES represent a turning point. If you seek a holistic approach to your hair loss, if you are under the impression that no one has taken your feelings and symptoms in serious consideration, if you think you do have some information about possible causes but you are missing the whole picture, if you want someone to support you and give you the right tools, if you feel you can make it but you do not know how, well you are choosing the right course to embark on! And on the top of everything, it is wonderful to be part of a community that can share fears and successes. I do not have any big spots anymore. It is a process; there is no short and easy answer. But above all, what I am really happy about is that I feel that my body is mine again. And I can listen to it. Your path might be shorter or longer, but this course is surely the right path! I wasn’t sure if the Reversing Alopecia course was for me. I suffer with diffuse hair loss and have not been diagnosed with alopecia officially. I consider myself fairly educated in natural healing and try to stay up-to-date with advancements in functional medicine and had been researching hair loss for nearly a year, so I wasn’t sure how much I would get out of the class. However, Jill encouraged me to sign up, and I am so glad I did. Jill is undoubtedly the best (and probably the only) expert out there on this subject. I have been blown away by her level of expertise concerning all things hair loss. She leaves no stone unturned and has an enormous wealth of knowledge when it comes to hair loss causes and solutions. She has done her research and understands the science behind her suggestions. She has eloquently and exhaustively explained the many factors that affect hair loss and has offered solutions—good solutions—for each. Her suggestions are designed to be doable and not turn one’s world upside-down. It is easy to listen to her because she truly understands hair loss, as she has suffered from a severe form of it herself, and has proven that it can be reversed. Jill is an exceptional practitioner who not only understands the mechanisms that drive hair follicle stimulation but who’s also very compassionate towards the people she works with. I have worked with several functional medicine practitioners since I developed alopecia and none of them understand the condition like Jill does. She knows the science behind all of her recommendations that drive hair growth. I am confident that working with her will reverse my hair loss and I am looking forward to a journey of healing ahead. Jill’s course provides a thorough understanding of the multiple factors that may impact those suffering from hair loss. It is well researched, detailed, and personal. In addition to teaching face to face, she is committed to answering questions on a daily basis during the course. Even before I took the class, I was inspired by her website and cookbook to discover my food sensitivities. The class has given me a fuller understanding of how to eat and supplement for better hair health. I consider it a template that will help me uncover what is causing my hair loss and then address it. I am already feeling more energetic after eating and do not have nearly as much digestive discomfort. Beyond the health benefits, her class and supporting materials reminded me how fun it is to cook and eat using foods that are really good for me! I can’t tell you how much I’ve gotten out of this program. Yes, it was often information coming out of a firehose, but embedded in the transcripts and handouts is so much great advice and “if this, then that” guidance on what to try and how to do it… as well as what not to do. I can’t thank you enough for all the heart you’ve poured into this class. It’s meant the world to me. It’s been exhilarating to see that there are tools to beat this crazy disease. I’m SO GRATEFUL that you are out there. You are an answer to prayer—keep doing the great work you’re doing!! This was a super informative online course! And I think everybody will agree with me: the most important is that you gave us such a structured approach, so it’s much easier now to navigate in all that information flowing around. Thank you wholeheartedly. You are not only very professional and competent in the field, but also extremely friendly and attentive coach, so it was a big pleasure to participate in the online class series as well as in the FB support group. You helped me to focus and fast-track my personal “inside job” to be done in reversing alopecia. And I look forward to the success stories of all of us! WOW! Where do I start to THANK YOU? Your program was so worth my time and money! I am highly educated in the functional world as result of my Hashimoto’s diagnosis 3.5 years ago. I work with a functional M.D., but I am constantly providing her updates on what I learn from great coaches like YOU. You have been a GOD SEND. THANKS JILL FOR HELPING SO MANY OF US!! Jill is incredibly knowledgeable and brings a wealth of experience to dealing with alopecia and autoimmunity. This course has been a deep dive into the science of the body and the complexity of it all in a way that is easy to follow and easily do-able and her commitment to her participants’ wellbeing is palpable. The course has been phenomenal! It’s really taking my knowledge to a much deeper level. I knew the whole autoimmune and alopecia challenge was complex, but this course has really shed (ha, no pun intended) a lot of light! Jill never promised us a rose garden. She made it clear we need to “do the work” to expect results. And then she laid out the path, explaining all the “how’s” and “why’s” clearly, with practical steps to follow. 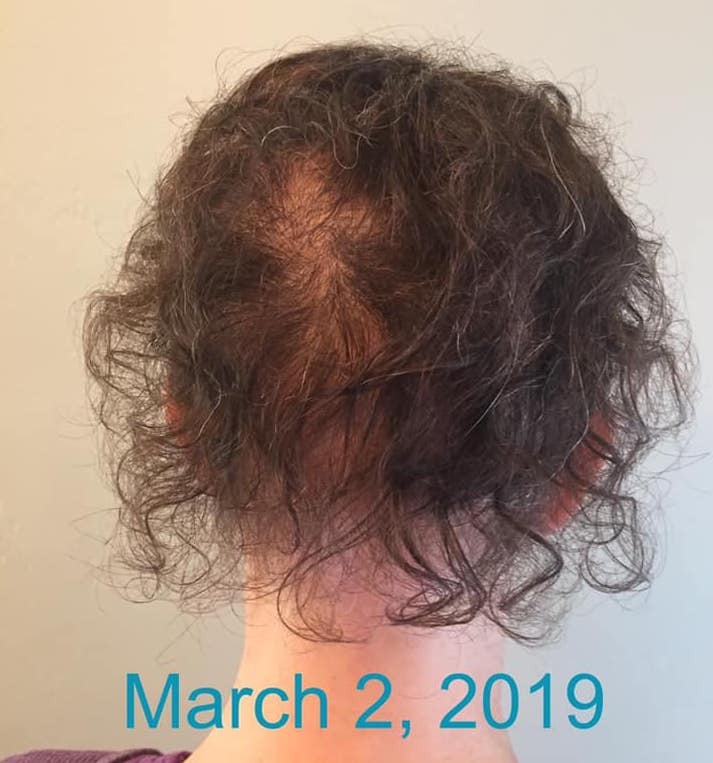 The Reversing Alopecia course was more effective for me than all the books, articles, and celebrity doctor recommendations (not to mention the lotions and potions) I’d tried before, because Jill helps you customize her plan for your own body. And our Facebook group has been an amazing source of information, support, and inspiration. Jill’s Reversing Alopecia course has been a game-changer—and worth every penny. Thank you, Jill! The depth of your knowledge is remarkable and I have already learned so much. God bless you, Jill!! Jill, it’s been a journey going through these modules with you. I knew deep down in my heart you are the one to listen to. Everything you’ve said so far just validates all my research on alopecia, and how permanently reverse it. Thank you for your dedication and passion on this subject. Jill, I was sad to miss your online course but I live in ther UK, work crazy hours, and have minimal internet out here in the sticks. Are you going to offer this in any other form, eg as a text download? And btw I recommend the Thyroid Cookbook to everyone who seems to have thyroid issues (a frighteningly large number of people). Thank you, for all of it. Thanks for sharing about our cookbook, Roselle! I have transcripts of the modules, but I’m not entirely comfortable sharing those without the context of everything else in the course. Email my assistant at inquiries [at] healthfulelements [dot] com and maybe we can work something out. I was diagnosed with Alopecia areata in 2009 with only 4-6 small bald spots and steroid injections did the trick then. Once I had my first (and currently only) child 3 years ago it intensified and I lost almost all of my hair. This time I refused to treat just all my symptoms and was bound and determined to find a root cause. It’s been a long 3 years with only little improvement. I continually have patches coming and going on my scalp. (Eczema has also been severe- I’ve dealt with severe bloating, cystic acne and postpartum depression). I just discovered you and waiting until Spring 2019 for th next course seems agonizing! Any suggestions on what I can do until then? (I’ve been GF/DF for over a year while focusing on all the lifestyle factors you’ve mentioned in posts and have been working with some holistic docs- about to start treating a parasite in the small intestine for 6 weeks-“diagnosed” by an acupuncturist). Thank you!!! Hi Alana, I look forward to having you in the course in the spring. The best way to stay abreast of dates is to sign up for my newsletter. As for what to do, it’s difficult to give guidance here, especially since alopecia can be so multi-factorial, but an Elimination/Provocation diet is a good place to start. I have androgenetic alopecia. Would this course be helpful for me? It looks so informative and I’m hopinh it could help me! Hi Lori, yes, a significant portion of the course covers androgenic alopecia, as do some of the handouts/resources. while not confirmed by a doctor I’m fairly confident that I have lichen planopillaris. my hair is no longer shedding, although I’ve got half the head of hair I had 7 years ago, but it’s not growing and I’m getting little keratosis raised brown spots near my scalp. It is frontal temporal loss, half my fingernails have vertical ridges and I already have a related autoimmune - vitiligo. Will your class be able to help me. Ive read that scarring alopecia are impossible to regrow hair. Hi Kim, I don’t know if it will help. I would get a diagnosis to be sure it’s scarring alopecia. There’s some good evidence that lasers and the herb gotu kola dissolve scars. hi kim .... i was diagnosed with LP in 2014. it's taken the last 5 years of reading, searching the internet for help. diet i found is what controlled things for me and i am sure if you follow jills advise and studies that it will work for you. i still beleive that something will help with the scarred areas, like the gotu kola. i do have a laser but i don't think it helped much, if at all but i still use it. maybe the combo of the 2 will help, any re-growth on those areas is my dream. the best of luck. I have spent quite a bit of time reading on your site and notice that most of those that post are females. Is this because they have a harder time coping with hair loss? I was diagnosed with alopecia aerata in the early spring of 2011. By early summer same year, I began to lose hair in my beard, mustache, eyebrows and eyelashes. Soon after I noticed I was losing hair on other parts of my body and by fall, same year I had lost all the hair all over except for a small patch on one calf. Two years ago I noticed I had some fine hair growing on parts of my head and edges of my ears. Fall of 2017 I noticed some facial hair also fine and some dark hair growing on parts of my scalp. The growth never improved beyong that and currently have not seen growth on other parts of my body. Prior to being diagnosed with alopecia I had a very thick full head of hair with little gray. Most people guessed my age ten years younger than I was. So being a male and having this condition start at 60 years of age I have found it at times difficult to deal with. Family and friends says I am the same person but when you look in the mirror and dont recognize the person there I know how I must appear to others. After having this for 8 years I still wear a hat all the time especially away from the house and only in the last year or so will be outside without my hat. Wondering if your course would benefit me. Thanks for taking the time to read this. I don’t want to be dismissive of the agony that alopecia can cause males, but generally, yes, it’s MUCH harder on women. Most in my prior RA course were women, but not all. I believe all of the men had totalsis or universalis. At least one had a difficult time following the program because of life stuff. At least two others have started to grow eyelashes and eyebrows. It can take up to a year to see substantive results, although many see results in as little as three months. You have to be in this for the long haul. And yes, I feel that the course could benefit you, but I of course make no promises. Jill, thanks for your responce. I signed up for your next short class juct waiting for the code to confirm it. hi kim .... i was diagnosed with LP in 2014. it's taken the last 5 years of reading, searching the internet for help. diet i found is what controlled things for me and i am sure if you follow jills advise and studies that it will work for you. i still beleive that something will help with the scarred areas, like the gotu kola. i do have a laser but i don't think it helped much, if at all but i still use it. maybe the combo of the 2 will help, any re-growth on those areas is my dream. it;s tough making a decision to try yet again another product. money just keeps flying out the window for all the products that make so many promises. the best of luck. Please enter your name and email for my semi-regular blog/email updates and to stay up to date on my upcoming Reversing Alopecia online course. We hate spam too. We wouldn't dream of renting or selling your email address. I don’t have to look for a wig, or use hair fibers, or undergo laser therapy or surgery. I feel ‘normal’ again!